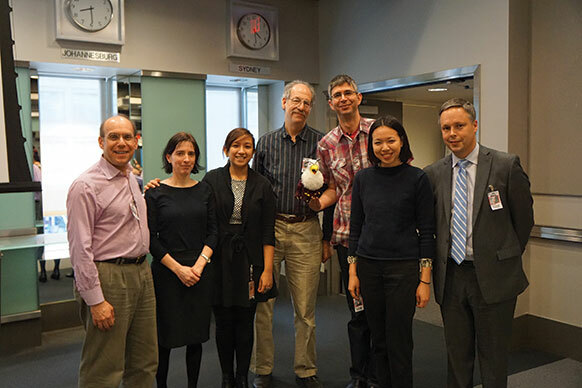 Yoram Bauman ’95 (brandishing Griffin) and DC Reedies infiltrate The World Bank. The World Bank is a serious place, tasked with a serious mission—to eliminate extreme poverty. However on a blustery day in February, the world’s only stand-up economist was invited to liven things up at the institution’s headquarters in Washington, DC. Sporting a fiery red “Enjoy Capitalism” t-shirt, Yoram, an environmental economist from the University of Washington, was invited to poke fun at the dismal science before a packed audience, the majority of whom are fervent followers of the discipline (plus a dozen Reedies who somehow infiltrated the event). Check out the video of the talk, as well as his latest book The Cartoon Introduction to Climate Change. The award-winning Oregon author Clyde Rice published his first book, A Heaven in the Eye, at the age of 81. He begins the book by telling how in his youth he stole the Reed College swimming pool. The stories get only more bizarre and exciting as he describes the bohemian history of Portland and San Francisco during the first half of the 1900s. Born in 1903, Clyde grew up in Portland not far from Reed. At the age of 78, he went in search of someone to help him publish his autobiographical writings and found Gary Miranda, Reed’s writer-in-residence at the time, who became his editor. Gary in turn found James Anderson ’77 of Breitenbush Books, and the upshot was A Heaven in the Eye, Nordi’s Gift, and a novella, Night Freight. During his long life, Clyde worked as an imitation flavoring salesman, logger, fisherman, and ferry boat deckhand. To some extent he failed at every one of those endeavors, but managed to turn his experiences into vivid and award-winning prose. Near the end of his life, Clyde decided to dedicate the rammed earth house he built on the Clackamas River to be a place for others who have big ideas and dreams. So Gary and Aron Faegre ’71 banded together with other caring souls (including Patty Cassidy, a former career counselor at Reed, and Mike Hayakawa ’78) to found the non-profit Friends of Clyde Rice, which now owns the property. The Rice Place is now an active retreat for people needing a quiet and special place to do creative work. Aron and Gary heartily invite alumni, students, and faculty to use the property as a retreat for a few days or weeks to work on creative projects. See www.ClydeRice.org for the calendar of openings. Connect with Reed and Reed alumni! Don’t miss out! 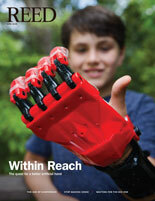 Be sure that your email address is up to date in IRIS so that you receive our enewsletter. When special events and opportunities become available on short notice, the only way for us to communicate quickly is via electronic channels!